Galumpki. Golumpki. Golabki. Gwumpki. Spell check is having a field day with me. But apparently all of those spelling are correct if you’re talking about some ground beef being wrapped up in cabbage with a crushed/diced tomato sauce. When I came across this recipe in my reader, it was like a lightbulb went off in my head and I recalled a memory of my aunt saying she was “makin’ gwumpkies” in a silly voice. Since my moms side of the family is Polish, I assumed a gwumpki was some type of Polish food, but I had absolutely no idea what it was and considering I was an extremely picky child, I had no interest in finding out. But since my tastes have matured, I immediately knew I wanted to make this recipe just for the nostalgia factor. I can’t wait to see my mom and my aunts face on Easter (the next time I’ll see them) when I tell them I made gwumpki soup! 1. Heat a large pot or Dutch oven over medium-high heat and brown the ground beef. Drain any fat. 2. Add the garlic, onions, Worcestershire, basil, cayenne pepper, salt and pepper and cook for 1-2 minutes or until the garlic is fragrant. 3. Stir in the cabbage and tomatoes (do not drain). Then stir in the water, beef broth and rice. Bring to a boil then cover and reduce to a simmer. 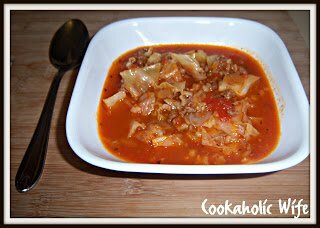 Cook for 1 hour or until cabbage is tender. I had no idea if I was going to like this or not, I honestly just made it because I wanted to make something Polish but this was really, really good. I had seconds for dinner and the remaining soup came to work with me for lunches until it was gone. Tom also really enjoyed this and said that he’d like to try a real gwumpki sometime soon so I know I’ll be adding that to the menu soon!